Patterns used to make the moulds for casting metal parts usually have sides that are slightly tapered. This makes it much easier to get the pattern out of the sand mould without bits of sand breaking off accidentally. Traditionally most patterns were made of wood. This is partly because it can be easier when making very complicated shapes. In the case of a wheel it is quite easy to make it out of aluminium. Even with a head that tilts both ways it does not help with round shapes such as a wheel. This can be done by mounting the workpiece on a rotary table and tilting the vertical head just in one direction. This will cut both sides of the rim just by rotating the rotary table. 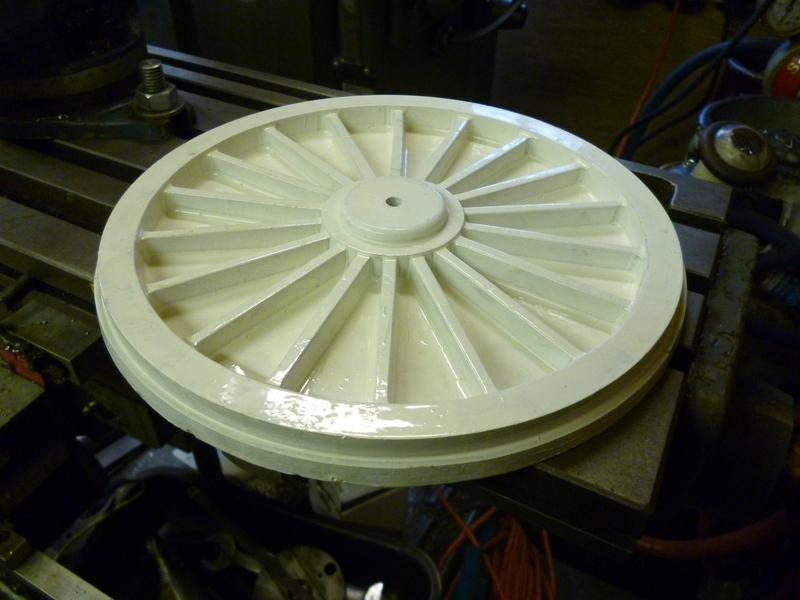 The spokes are not only tapered in order to be able to withdraw the pattern from the mould but, when looking at the wheel from the side, they are tapered from the middle of the wheel towards the edge. This means that one side of a spoke has to be aligned so it is at right angles to the milling table with the head tilted in the x/z plane. If this is, say, the left of the spoke then all of the left sides of the spokes are milled with the y movement of the milling table locked. Then the same is done for all of the right hand sides of the spokes. After the rim and the spokes had been cut with the head tilted the head was set vertical. A small chamfer was then cut along all of the edges using a center drill in a drill chuck.